Reed St. Mark is an American drummer best known for playing with the avant-garde Swiss heavy metal band Celtic Frost. St. Mark (born Reid Cruickshank) joined Celtic Frost in 1985, after leaving the Swiss hard rock band "Crown", for the recording of their Emperor's Return E.P. and the highly influential To Mega Therion and Into the Pandemonium albums. After extensive touring with the group, St. Mark left Celtic Frost in 1988 only to later join the funk metal group Mindfunk, playing drums on their self-titled debut album for Sony/Epic in 1991. He left Mindfunk in 1992 to re-join Celtic Frost for the writing of the unreleased Under Apollyon's Sun album. During his time with Celtic Frost, St. Mark's various trademarks included rows of women's high-heeled shoes arranged on his drum kit and playing drum solos with oversized sticks. He was also noted for his highly visual and flamboyant drumming style as well as hitting his drums exceedingly hard. He was said to have destroyed drum heads on a daily basis as a result of his hard-hitting technique. St. Mark performed with Celtic Frost on a Sonor Phonic Plus series double bass kit, that included a Sonor Signature Series 8" steel snare drum. His cymbals used were mainly Paiste RUDE series known for their durability and powerful tone. In the studio and sometimes live, he would include some of the Paiste 2002 line. 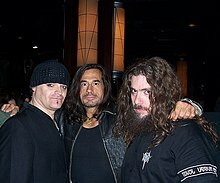 In 2008, St. Mark was briefly involved in a new project called Triptykon with former Celtic Frost band mate Thomas Gabriel Fischer. He is also listed as a contributing artist for the Septimus Orion project which released its first album in 2008. This article on a United States rock drummer is a stub. You can help Wikipedia by expanding it. This page was last edited on 31 March 2019, at 18:02 (UTC).